While some farm systems across the MLB were shaken up at the trade deadline, the Colorado Rockies kept most of their young prospects intact. 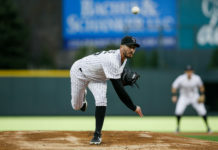 Colorado traded Forrest Wall and Chad Spanberger to the Toronto Blue Jays near the deadline but were otherwise inactive with trades. Now, just over two weeks from September call-ups, teams will begin to look at players they want to add to their expanded active roster on Sept. 1. As a current contender, the Rockies will almost certainly be among the teams calling up players to help them down the stretch, or at the very least, have them get big league experience. Though they only have two prospects in MLB Pipeline’s top 100, the Rockies do have other intriguing options in their system. Here’s an update on some of the team’s prospects who could make their way onto the roster in September. Lambert’s consistent climb through the Rockies’ farm system shows the steady improvement he’s made since being as a high schooler in the second round of the 2015 MLB Draft. Lambert was promoted to Triple-A Albuquerque in early July after dominating the beginning of the season in Double-A Hartford. The righty has worked his way through some troubles with Albuquerque but still boasts a 3.13 ERA and 5.28 K/BB ratio. As Colorado’s No. 2 prospect, it would be no surprise to see Lambert added to the bullpen in September to continue his MLB preparation. The memories of Matt Holliday’s postseason heroics in LoDo resurfaced when he signed a minor league contract at the end of July. After retuning things in a game of rookie ball, Holliday has been steady for the Isotopes. Through nine games with them, he is batting .265 with two home runs, three doubles and has more walks than strikeouts. The main reason the Rockies brought back Holliday was to add a veteran bat and clubhouse presence for the end of the season. If he gets called up, Holliday could be just that. The club promoted Rodgers to Triple-A Albuquerque for the first time in his career at the end of July. Through eight games and 31 plate appearances, Rodgers’ play has dropped off a bit. He is hitting .226 with two extra-base hits and eight strikeouts compared to zero walks. The No. 6 prospect in all off baseball has proven his talents throughout lower levels of the minor leagues. Before his promotion, Rodgers was hitting .275 with 17 home runs, 62 RBIs and 12 stolen bases at Double-A Hartford. 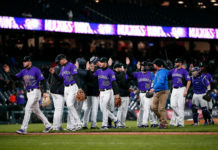 He still may be another spring training away from contributing for the Rockies, but some action late in the season – especially if the Rockies fall off – could only enhance that development. As the Rockies proved when they called up Hampson for seven games last month, he is the middle infielder most prepared for MLB action. During that limited action, Hampson went 6-for-24 (.300) with a double, a triple and two RBIs. He’s played even better at Triple-A and is still on the Rockies’ 40-man roster, meaning they will not have to clear a spot for him to be added to the expanded active roster in September. 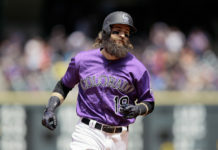 Given his speed – he has 34 stolen bases this season – Hampson could give the Rockies a specialty player for the end of the season. After being selected 22nd overall this year, Rolison has already risen to the team’s No. 6 prospect in rookie ball. He is nowhere near the major league roster yet, but Rolison has been very impressive thus far. In six games started, he holds a 2.25 ERA, 0.85 WHIP and 11.3 K/9 ratio.